← Fold-down attic stairs in the garage? 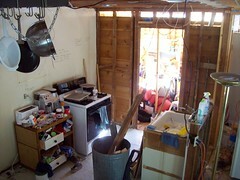 Construction started on our remodel/addition project six months ago, today. We were hoping to be finished by now, but at least the end is in sight! I’m almost done with the wiring (*finally! *), and we’re just about ready to jump our next major hurdle–rough frame inspection. Once we’re past that, we’ve got about four weeks until our kitchen is operational, so we ought to be able to host Thanksgiving this year. Hooray! – (stucco) House wrap and lath for stucco. We’ve got a busy weekend ahead of us! But hopefully we can be ready for our rough frame inspection by late next week, which would leave us five weeks until Thanksgiving. It’ll be close, but I think we can make it. 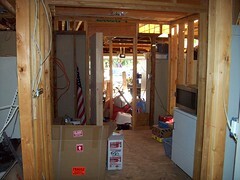 This entry was posted in Our home remodeling project, Uncategorized and tagged electrical, kitchen, stucco. Bookmark the permalink. Just registering my peek at your blog…quite an ordeal this remodel business! Where do you live in the meantime? At least the pot rack is up…bodes well for Thanksgiving victuals. Cal and I are having a house warming (no gifts solicited) slash open house to celebrate the demise of the last moving box. All kith and kin are most welcome. Oct 20, a Saturday evening from about 5 PM to whenever. Comida e bebitas gratia del casa. Hi Greg! 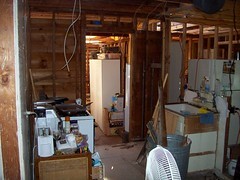 Actually, we’re living in the house while we remodel it. F-U-N! I really hope we can make it to your house warming, but we’ve got an *awful* lot to do this week and next!